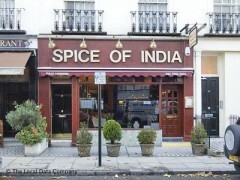 About: Spice Of India serve a variety of Indian dishes at their restaurant. Catering for private parties of up to 20 people is available upon request. Quite expensive, slightly upset my stomach, they added unlawful service charge, small portions, don't speak English very well. Treat you as if they give you free food. Food tasted good though. Service charge should be optional not added to the total. amazing food! been here a few times, ever since I was little with my parents after a good swim down porchester hall, worked up an appetite! now that I'm older and have moved far out, always try to go there when Im in the area! staff are very attentive, get free pineapples after the meal to clean the palette :) no complaints! hilt recommended to all who love their indian food! pricey, but worth every penny! and was quite star strucked when I saw a few celebrities walking in :O !!! Great food and good value with only minor quibbles.EVERYTHING is ala carte. They post the price for their papadums at 70p. They bring you 4 but the 70p is the price for only one so they are actually 2pounds 80p. The onion chutney they bring with the papadums was an extra 1 pound. I have been to Spice of India on a regular basis since they opened and will definitely keep on going as the food is excelent, fantastic prices, the service is very good but remember! don't chase us out when you think you need the table for others! We know you need to make money,we need to unwind. Me and my wife visited the Spice of India on our visit to London for our 1st Wedding Anniversary as we were stopping in a hotel in the local area. We found the food very good. Lots of flavour, good sized portions, very filling, and well worth its value for money. As the restaurant is only small, and has only 10 tables max. I personnally felt that the waiting on staff were trying to rush us through our meals,especially when they cleared my plates, when my wie had not even finished. That I would say was my only critic. Every time my husband and I visit London, we make sure to have Dinner at this lovely restaurant. The food is always excellent and we have never failed to get a table, even though we have sometimes turned up with as many as 7 people unannounced. Fantastic (and generous) Onion Bhajis start our meal off and whatever dishes we choose always please us and leave us so full we have to stagger back to our hotel! Would definately recommend this place for anyone staying in bayswater/paddington area, just a short stroll from Sussex Gardens, along a couple of pretty london streets and mews houses. Very reasonable prices too - wine and food excellent!